Screw Michael Arndt and his F1 car made of matchsticks. 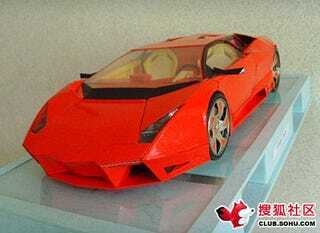 We've found a fan of pricey super cars who's trying to one-up Arndt with a Lamborghini Reventon made of cigarette boxes. That's right — the Reventon — the one million Euro ($1.5 million) supercar constructed entirely out of cigarette boxes. Call this a convergence of one man's passion for the finer items in life and self-destruction: Lamborghinis and cigarettes. Which is which? We guess it all depends on which category you think a buck per mile maintenance cost lands the Lambo. All we know is it's an example of some seriously exceptional papercraft. Check out the gallery below and see it compared to its real life Lambo counterpart.